UPDATED 3/1/2012: I have a new Point of View page on my blog! Click HERE for links to past collages and the latest and greatest on all Point of View happenings! Remember when I mentioned that there was something neat coming up on my blog? Well, I finally get to share it with you today! A few weeks ago I was approached about joining a group of bloggers to collaborate on a new project, and I was immediately interested. I'm really excited to tell you about Point of View: A Creative Collaboration. 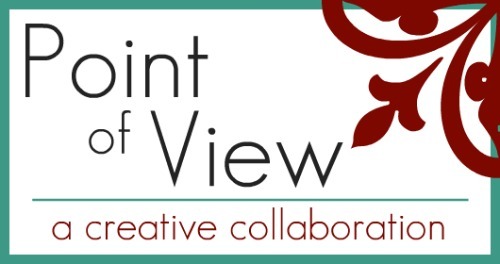 Here's how it works... Every month a theme or project idea for Point of View will be announced. Each member of the group will come up with their own take on that month's theme. On the 4th Friday of every month, each of the members will share their own project as well as pictures of and links to the other members' projects for that month, and there will be a link party where you can link up any projects you have done that relate to that month's theme. Cool, huh? To kick things off, the theme for March is skirts! Use a pattern, make up your own, use another blogger's tutorial, refashion a skirt you already have... there are no rules! I'm really excited about this month's theme because I already had plans to make my girls skirts for Easter this year. Now I have a little motivation to get them done early! Hope you'll join us! Perfect! I'm in the process of making a couple skirts for my girls, too! What fun. Sounds like a neat idea! Time to dust off the old sewing machine! That sounds exciting! I can't wait to see what you guys come up with and maybe I'll get my rear in gear in time to submit something! Cool idea, Gwen! I look forward to seeing the combinations and permutations! How exciting for you!!! Is it mostly sewing projects or will there be other DIYs as well? What a great idea for a new linky! what a cool idea! I just made two skirt today also. lol! Awesome! This sounds like fun! Sounds like an interesting way to share projects, etc. I have a skirt idea in my mind right now!